Various uses of water: We use water for bathing, washing, mopping, cooking, drinking, etc. Factories need lot of water to produce the items required by us. Farmers need lot of water to irrigate the crop. Thus, water is required for many activities. Sources of Water: We get drinking water from rivers, ponds, lakes or from groundwater. About two-thirds of the earth’s surface is covered with water. But most of this water is in the form of saline water in oceans and seas. We cannot drink saline water. Just a minuscule portion of the total water on the earth is available in the form of freshwater. The water on the earth keeps on changing into three states of matter, i.e. solid, liquid and gas. The process of cycling of water into different forms of matter is called water cycle. 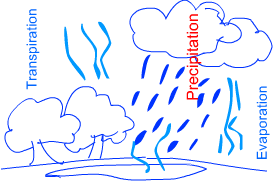 Evaporation: The process by which water changes into vapour is called evaporation. After evaporation, water vapour goes up into the atmosphere. Evaporation happens on all temperatures but higher temperature results in faster rate of evaporation. Transpiration: The loss of water from plants through numerous pores in leaves and stems is called transpiration. Water vapour also comes through transpiration. Cloud Formation: When water vapour reaches very high in the atmosphere, it condenses because of low temperature. This leads to cloud formation. When too much water vapour accumulates in the cloud, it is unable to hold water. The condensed vapour then falls down on the earth in the form of rain or snow or sleet. Thus, the water which escapes from the earth’s surface comes back. The rainwater comes down on the ground and flows to the rivers, ponds and finally to the ocean. Some of the rainwater seeps down the ground to recharge groundwater. The circulation of water (in different states) on the earth is called water cycle. Problems of heavy rains: Heavy rain can lead to floods. The rivers overflow during flood and inundate the surrounding areas. Crops, houses, and livestock are badly affected during flood. Flood even affects the wild animals, e.g. recent floods in Kaziranga Wildlife Sanctuary. Problems of no rains: Some areas do not receive rain for a long time. In that case, the area suffers from severe drought. Drought leads to crop failure and shortage of drinking water. People and cattle have to suffer the problems because of drought. While people are forced to migrate to other places, cattle often die in case of drought. Rainwater Harvesting: Most of the rainwater goes waste as run off. This water can be channelized to recharge groundwater or can be stored in tanks for later use. The process of storing rainwater for future use or for recharging groundwater is called rainwater harvesting. For this, the water collected on rooftops is channelized through drains into underground tanks or reservoirs. The water is allowed to get filtered and sometimes is even treated suitably to make it fit for use.